"The women’s-specific Osprey Aura AG™ 65 relies on Osprey’s Anti-Gravity™ suspension system for outstanding ventilation and comfort. 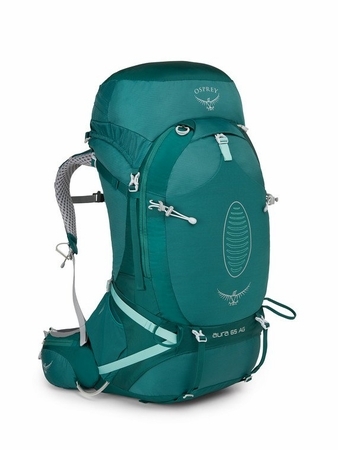 This pack is often found on the backs of experienced thru-hikers. Osprey’s Anti-Gravity™ suspension system—a seamless backpanel composed of lightweight mesh extending from the top of the backpanel to the hipbelt contours to the body to deliver outstanding fit and unrestricted movement. The Fit-on-the-Fly™ hipbelt and easily adjustable torso length optimizes comfort on the trail. You can access your gear through the top of the pack. The versatile floating top-lid is removable to shave weight but an integrated FlapJacket™ is always onboard to protect your gear from the elements. There are also two front panel pockets to keep essentials from going astray. Final touches on this state-of-the-art pack include the Stow-on-the-Go™ trekking pole attachment system, and ice axe loops for winter ascents. 3661 in3 / 60 L | 27h x 15w x 15d in. | 4.18 lbs. "